Wretched soul are a death/thrash metal band from Canterbury. 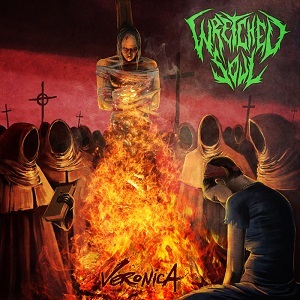 The band played Bloodstock festival last year, and on 9th September will be releasing their debut album, Veronica. The album kicks off with ‘Where shadows ride’. The guitars have a very traditional heavy metal feel to them, although the speed tends more towards thrash, but the vocals are definitely more in the death metal style. The resulting mix works really well. Half way through the song the pace changes and becomes slower for a while before it picks up again later. A great song that gets the album off to a good start. ‘Summon the hunter’ is a fast paced song with a mix of clean vocals for the chorus and death metal style vocals for the verses. Nice guitar riffs and a good strong tune make this another great track. ‘Veronica’ starts off sounding more like a hard rock track, with the pounding drums being the main clue there’s more to come. It’s not long before the growling vocals kick in and alternate with the clean vocals. A great track. This is a great debut album – definitely a band worth listening to.